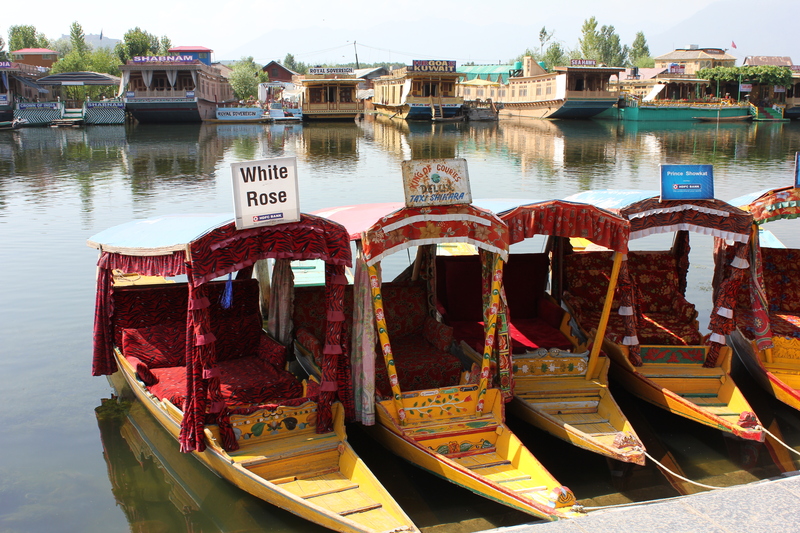 What do I need to know before I go on a Kashmir houseboat? Don’t get fooled by the high prices of the Shikaras, as a resident of the houseboat you are entitled to at least two complementary rides in a day. Carry mosquito repellent so that you are able to enjoy the view without buzzing disturbances. Try preventing yourself from buying jewellery or other items that the Shikara walas bring to your houseboat because they are overly priced and you’ll get the same thing for much less at the markets in the city. You can go Jet skiing or do other water sports in Dal Lake, but don’t go swimming in the Dal because you can never be sure of its cleanliness. If you are out travelling in the city then try coming back before midnight, because even though the houseboats boast about 24×7 service of the shikaras. You will end up really struggling for one at night! I spent four nights in a houseboat in Kashmir. The weather was a welcome change from the mugginess of Delhi, and I straightaway headed to Boulevard and hired a boat to row me to my house-on-water. This would be my home for the next four days. Hmm. So the view is slightly different from what one expects – there aren’t any moving houses on flowing water (though later it turned out only I had such a fascination, but there HAS to be someone else too!). The houseboats or ‘Doongas’ as they are traditionally called, etched on the edge of the still Dal Lake are in fact more like long elongated boats, boats with walls. This long stretch of boats lined one after the other encircling the lake, almost creating a colony of their own prove to be one of Srinagar’s paramount attractions. When you arrive there and get the beautiful experience, you know why! Our destination was- Ghat no.16 at the Shabnam houseboat, the name is perhaps a cute Bollywood inspiration or an attempt to keep up the trend of unusual names that the houseboat owners give to their creations. Names like ‘Meena bazar’, ‘Queen Elizabeth’, ‘Robin hood , ‘Happy dawn’ , ‘Taj palace’ or ‘Buckingham Palace’ kept us entertained during our ride in the local Kashmiri gondola called the Shikara. The Shikara ride is not very different from any other boat ride; the only thing that changes is perhaps the scenic view – so alluring that the ride seems like one you’ll never get to take again and that makes all the difference. After ten minutes of the serene boating through the lake we finally reached Shabnam. Our fascinating residence was about 80 ft long and 15-20 ft wide on the outside, the cedar interiors, as we were told had been intricately carved by hand displaying the brilliant artistry of Kashmiri craftsmen. As we stepped inside the sitting hall, the décor gave us something of a Victorian feeling! We wondered what English furniture was doing in Kashmiri houseboats, when Altaf, our caretaker whilst our stay at Shabnam told us that at the time of the ‘raj’ these houseboats were originally built by the British seeking permanent residence in Kashmir. They were denied permission to occupy land by the maharaja and so, they created their homes on water. Well, at least some of the houseboat names made sense now! The woodwork in these boats is exquisite; with Edwardian furniture the rooms are cozy and spacious. Each room has a hand-crafted ceiling and hand-carved cedar paneled walls. The floors and corridor are thickly covered with traditional and colourful Kashmir rugs and carpets. My biggest apprehension about living in a boat: the toilet! Turned out to be decent too, all the rooms in the boat have attached bathrooms, electricity and modern plumbing .But one thing that disappointed us was the VIEW from the room. What you expect: the water clear as crystal and shines like a million little diamonds when each ray of the sun hits the surface. A view that is calm and serene and cool. What you get: the view of the next houseboat (not what I paid to see exactly)! Since these houseboats are placed linear, there is no water view from your bedroom. There is though, a charming balcony to every boat with a comfortable seating where you can enjoy the wonderful view along with smooth conversations. One doesn’t realize how the evening passes away in Srinagar savoring Kashmir’s rich culture, traditions and beauty. Touring the city by a Shikara you get a bird’s eye view of the ancient city laid out on the either bank of the Jhelum spanned by nine bridges and you can observe life on the banks as well as the life of the people who still live on water the Doonga Dwellers. The fascinating language, exaggerated expressions, magnificent views of the hills, the pleasing weather with a pinch of the chilly breeze . The only little problem is the high costs of the Shikara rides taken from tourists, especially during the season. Since they are the only means of transport at the lake, one has no choice but to give in to the prices. The house boat is a true home-like experience; this was proven true when we were told that our meals during our stay could be made to order. Whatever we would like to eat, would be cooked by the chef if we tell him just two hours prior. So we made our pre-order for the breakfast for some paranthas (can’t leave the Delhi-walla in me behind!). After the delicious meal, we made an exciting discovery of a rooftop sundeck- another feature of the houseboats, from which one could take in the Himalayan views and enjoy the brisk fresh air. We sat on the roof under the dark blanket of the night, glittering in all the right places. For an extra touch of Kashmir, Altaf gave us a sheesha, which according to him goes perfectly with the aura upstairs. Surprisingly, we enjoyed our hookah session that chilly night, viewing the silent lake whose ripples were blending with our conversations. Later that night when we slept, we all felt smooth movements of the boat and we were told that though the boats are stationary they remain floating slightly. I think you need to live in a houseboat at least once, for the morning view! The first thing we did as we woke up was to rush out to the balcony. The Dal Lake looks the most beautiful at dawn. The site of children going to school and people going to work on the smaller and more local shikaras (for personal use) in the light of the early morning sun and the golden reflection of the lake is extremely pleasing. A local woman vocalized a Kashmiri melody as she was rowing one of such small Shikara that morning. We didn’t know what the song meant, but we knew she was grateful to God. Just as we were to be able have this enchanting experience, a travel secret we would cherish forever.